I'm trying to get Windows 10 on a 3TB HDD (2.7TB Ptn). The BIOS is in UEFI mode, but I am unable to add any boot options. The USB key for installing Windows 10 was made with Rufus and supports UEFI-based computers. The 3TB HDD is already configured as a GPT drive with the required 4 partitions. Windows setup will only boot in BIOS mode despite me taking the bootmgr file(s) off of the install USB key. In the BIOS, when I try to add ANY UEFI boot option, I get an immediate "File System Not Found" error, so I can't do that. How do I get this to work, or does the OptiPlex 990 not support 3TB drives? The latest BIOS is installed as well. The 990 is Class 1 BIOS not UEFI Class 2.31 bios. For older systems WDC uses an OEM Highpoint Rocket 600 PCI-E controller. Western Digital Handles this with a PCI-E Host Adapter HighPoint Rocket 620 card. This is why Western Digital Gets around this by using a HOST BUS ADAPTER on non UEFI systems. 3TB and LARGER drives Requires 64 bit CPU, BIOS, OS. AND GUID Boot Code with the latest INTEL Rapid Storage Drivers (F6) or 3rd party Card that does GPT Booting. 32 bit generic boot code in the MBR cannot support 3TB. GPT allows for a maximum disk and partition size of 9.4 zettabytes.Most current operating systems support GPT, although some operating systems (including Mac OS X and Windows) only support booting from GPT partitions on systems with EFI hardware aka the "BIOS" to boot can be in an addon Controller. The MBR BIOS partition table restricts partition sizes to a maximum of 2.19 terabytes or almost exactly 2 TiB (2,199,023,255,040 bytes or 4,294,967,295 (232−1) sectors × 512 (29) bytes per sector). Western Digital Does this with a GX620 and a PCI-E Card with Boot Rom. Since most current systems don't yet support UEFI standards, WD is providing an interim solution for those who want to boot these high-capacity drives in certain operating environments; they're including an AHCI-compliant host bus adapter (HBA) card with the retail drive kits. This allows legacy BIOS motherboards and GPT-ready operating systems to use a known driver to correctly support large capacity drives. While not a perfect solution, WD had to either go this route or hold off until UEFI adoption warranted the drive release. Presently WD does not directly provide support for these applications. We have worked extensively with our partners and solutions may be available. HBA and RAID Controller vendors may have developed solutions for these applications. Linux solutions are available. Please consult your Operating System provider for use with Large Capacity drives. An available PCI-E slot for the HBA is required. Supported by using the native Windows Advanced Host Controller Interface (AHCI) drivers only. Apple Bootcamp is presently not supported. Support is limited to the operating system only. Boot support requires a system with UEFI Support and a 64 bit version of the OS. Check with USB Bridge provider to verify if and how Large Drives are supported. I have no idea what you mean by a "The 990 is Class 1 BIOS not UEFI Class 2.31 bios." This firmware can boot with UEFI from GPT disks. This is 64-bit UEFI. But it seems to have some oddities! Whenever I try to add a UEFI boot entry, I get "Boot Name Not Found". This is a bit like the original poster's "File System Not Found". If I leave the SATA host adapter in RAID mode, the system boots my OS (Fedora Linux on a GPT drive). If I put the SATA host adapter in AHCI mode, it gives me a boot menu with all sorts of choices most of which I've disabled in the firmware ("BIOS") setup and waits for me to chose. It won't accept my USB keyboard to make those choices (grrrr.). With a PS/2 keyboard I can select my OS via two different entries. Summary: UEFI seems pretty awkward but it is there. I admit there are a lot of counter-inuitive UEFI implementations, but this is one of the more annoying. I have not tried a disk larger than 2T (the MBR limit). Linux distros can use GPT disks on MBR-only computers. Even as boot disks. But of course UEFI isn't used in this case. I don't know whether Windows supports this. As far as I know, you can only install 64-bit Windows on a 64-bit UEFI system. Oops: while I wasn't looking Dell released firmware A19. Installing now. Probably no different. BIOS can be Class 1 or Class 2 or Class 3. Drives Larger than 2TB REQUIRE INTEL RST 10.1+ F6 Drivers. These systems are NOT listed as supporting windows 8 let alone 10. Windows 10 Has newer drivers and NEW RST drivers DO NOT SUPPORT the older chipsets. As they go up from 9 to 10 to 11 to 12 to 13 to 14 etc they drop support for Older motherboard AHCI ICH controllers. Windows 7 does not support UEFI 2.3.1 Secure Boot. Nor does the 990 bios. This is why the HBA(Host Bus Adapter) is REQUIRED as it adds bios extension to allow larger than 2TB booting. The 990 does NOT support larger than 2TB booting Nor does INTEL RST support Raid Volumes larger than 2TB. Drives smaller than the 2TB barrier will not have issues. You have Class 1 bios. Thanks. I had ever heard of PC firmware "class" before. It seems a bit goofy. It seems as if the difference between class 1 and 2 is only whether one can configure the firmware to turn off CSM. Not a very interesting distinction. So Class 1 can run any software that class 2 and class 3 can. So: the fact that the 990 is class 1 cannot be a problem. Why did you bring it up? I don't think that there is such a thing as Class 2.31. 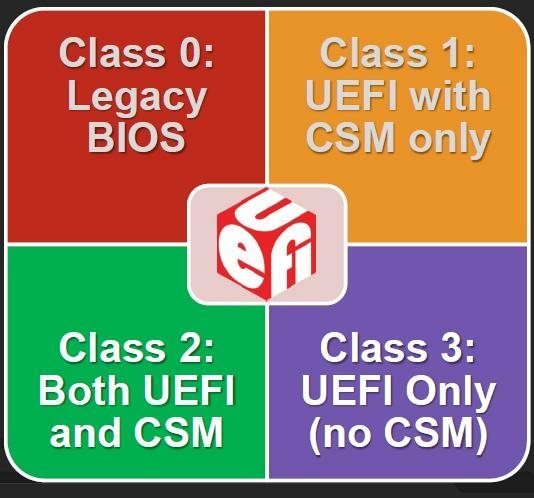 The UEFI standard goes through revisions. Perhaps you meant UEFI revision 2.3.1? I have no idea what revision level the 990 A19 firmware implements. 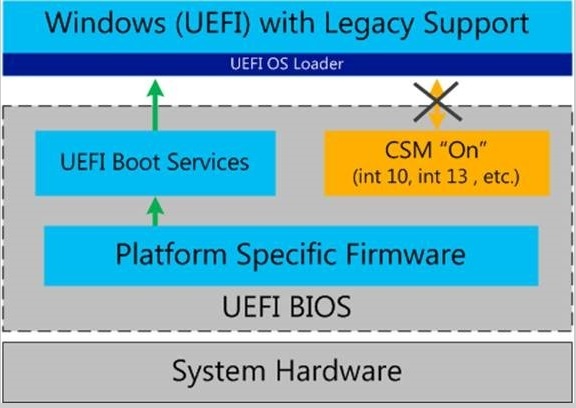 It looks like Windows Secure Boot requires UEFI 2.3.1 or better. That does not imply to me that Windows UEFI boot requires this (Secure Boot implies UEFI boot, but not the reverse). Clearly driver support in Windows can be a problem and may well be the original poster's problem. One slide refers to "UEFI BIOS". UEFI firmware is not BIOS, it is an alternative and replacement for BIOS firmware. CSM is a BIOS emulation module in UEFI. Too bad about Windows not supporting booting off a large drive without UEFI. Linux certainly does. It supports booting off a GPT disk (cleverly disguised as an MBR disk for the benefit of the BIOS boot process). Class 1 is CSM Only and has MBR and supports MSDOS and GRUB. The first thing they started to remove was MBR and ATA mode for sata operation. This makes it so you CANNOT INSTALL XP or any older Linux distribution or MSDOS MBR.